Fat loss monitor with scale. Easy to read 2″ extra large digital display. 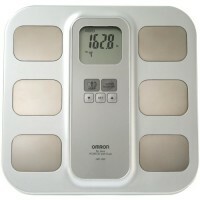 Measures body fat percentage in .1% increments. Weight capacity up to 330 lb (.2 lb increments). Four person profile memory plus guest mode. Displays previous reading. Chrome metallic finish.